This is a photograph of Bono, the lead singer of the Irish rock band U2, performing in Paris on December 7, 2015. U2 was originally scheduled to perform in Paris in November, with the concert to be broadcast on HBO, but the band had to postpone due to the terrorist attacks in Paris, which included an attack on a rock concert featuring the California band The Eagles of Death Metal. The rescheduled concert was broadcast on HBO the evening of December 7th and I watched it and recorded it for repeat viewing. Of course, the terrorist attacks upped the ante for the rescheduled show and created, at least for me, an expectation that it would be in some way more meaningful, especially given the band’s tendency to wade into political matters. So I was anticipating a great performance, but was also a bit cynical about the prospect of these wealthy rock stars getting paid a ton of money to play a show and thinking they could somehow convey something more than the pleasant buzz one might associate with popular musical performances. The show started out quite serious, with a mix of new and old material and plenty of seemingly heartfelt pronouncements, such as we are all Parisians tonight. A standout was the U2 standard Sunday Bloody Sunday, which evokes the period of Irish troubles deriving from religious and political conflict between north and south. The band had the good sense to have the members line up at the front of the stage, with the drummer playing a shoulder-hung drum like in a marching band. The visual was like something out of Les Miserable; the revolutionaries pushed up against the barricades. Then things became even more serious, with Bono explaining the genesis of the material on the band’s new album and drawing a loose connection between experiences the members had growing up during the troubles and current events. This part of the show ended with Bono imploring a higher power to bring comfort. At this point I was thinking that the show was doomed to linger in a tone of sadness and maudlin pomposity. But then a curious thing happened. A full on rock concert broke through the gloom. That line: I reached out for the one I tried to destroy. It was a transcendent moment; at once a battle call and a moment of tenderness. I’ve been thinking for a couple days now whether this concert was important. It occurs to me that the terrorists thought it was important to kill a lot of people at another concert, and not because they were pissed off that the band made money off it. Maybe that’s because they realize that music does have meaning beyond the business side of things. On that note, U2 struck a blow for the good. This is a photograph of Alan Turing, an historical figure who is the subject of the film The Imitation Game. 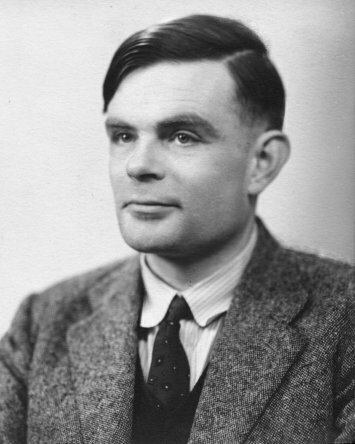 Mr. Turing was a homosexual in England at a time when homosexual conduct was illegal. It seems odd to point that out, given the shift in societal norms lately. I only point it out because it is a plot point in the film. The film weaves the fact of Mr. Turing’s sexuality into the screenplay, but viewers can watch the film, as I did, and conclude that his sexuality did not define him so much as his quirky, forceful personality, and his genius. Watching the film, it occurred to me that it must be intended to convey something more than just Mr. Turing’s achievements. It seems intended to focus those achievements through the lens of his sexuality; perhaps to say that what he achieved is all the more impressive if considered in the context of him being a victim of bias and ignorance. Mr. Turing led a team of cryptologists charged with breaking the Nazi encryption technology known as Enigma during World War II. In the process, Mr. Turing invented an electro-mechanical precursor to what is now commonly referred to as the computer, thereby saving millions of lives by bringing an early end to the war. I recommend seeing The Imitation Game. All of the performances by the actors are excellent and the screenplay is thrilling when you consider that cryptology could easily be a dry topic. The only thing about the film that gave me pause is the focus on Mr. Turing’s sexuality. Not that being gay is a bad thing, but the notion of him being a victim seems inconsistent with the fact that he is a hero. Granted, it would have been a different film if Mr. Turing’s sexuality had been kept out of a screenplay that is primarily about his momentous achievements. I can’t help but wonder if he would have preferred it that way. Well, Sony and independent theaters finally did the right thing and allowed Americans to watch the new Seth Rogen film, The Interview. The neat thing about seeing this film is that it exists in the unique context of an international incident involving the United States, North Korea, and shadowy computer hackers. The story about why the film’s release was delayed has played out like some bizarre performance art piece that rivals the film itself in it’s sheer absurdity. The film combined with it’s context has become a separate piece of art. I have to review that separate piece of art, because that’s what I saw, and, at least for me, it was impossible to separate the film from it’s context. A talk show host and his producer receive an invitation to interview the leader of North Korea, Kim Jong Un, and are recruited by the CIA to assassinate him. It’s a silly premise, but removing any hint of seriousness from the get go opens up the screenplay and let’s the writers roam free in an absurdist wonderland. There’s also plenty of funny meta-level stuff about the entertainment industry, including a cameo performance by the rap superstar Eminem as a guest on the talk show. By the way, there has been speculation about Eminem’s health based on recent photographs of him. His physical appearance in the movie will do nothing to dispel that speculation. He didn’t look well, even while wearing theatrical makeup. 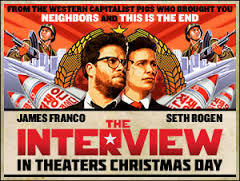 The Interview has not received glowing reviews from critics, but those reviews were of the film itself, absent the contextual wrap-around of the international incident. I really enjoyed the film and thought it was very funny. The funniest thing about it is that the jokes sort of get mixed up with the over-the-top propaganda coming out of North Korea about the film. For example, the film opens with a young North Korean girl singing a patriotic song in Korean. The lyrics are shown in English subtitles and could have come straight from the North Korean government. That part was hysterical. Another funny thing about the film (in context) is that it’s primarily a typical Seth Rogen/James Franco buddy movie that doesn’t take the subject matter seriously. The fact that North Korea got so upset about it is farcical. I can only imagine that they didn’t see it, because it actually portrays Kim Jong Un in a fairly sympathetic way, more than would be due if the subject matter was treated seriously. I bought The Interview rather than renting it. I did that because it’s not just a film; it’s a unique piece of history, and I want to keep it for repeated viewings and future pop-culture references. If you haven’t seen The Interview you should; not out of any sense of patriotic duty, though it is a pure manifestation of the state of American culture; but because it’s a very funny comedy that will have you exiting the theater with a spring in your step. The independent theater owners who screened it, and Sony Pictures, should be applauded for doing the right thing, albeit belatedly. 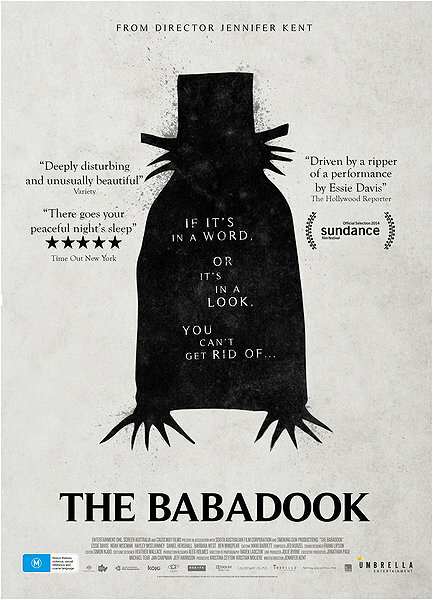 I just saw the new film, The Babadook, written and directed by Jennifer Kent. This is her first major film, and if her subsequent films are of the same quality, she can look forward to a long and successful career. Having said that, this is a grim, trying film. It works as a piece of cinematic art, but I must say that, for me, it works less well as pure entertainment. Had it been released the day after Halloween instead of the day after Thanksgiving, I might have a different opinion. A widow and her six year old son are confronted with a metaphysical threat when they find a children’s book in the boy’s bedroom and read it together during story time. This is the unique part of the film and it provides a lot of good tension and dreadful good fun. The rhymes in the book are very inventive and creepy. Ms. Kent should be applauded for that, since she wrote the script. The performances are very good by all the cast members, although I reserve comment on the child actor who plays Samuel. If his performance tracked the director’s vision, then he was amazing. If not, then his performance detracts from the film. The first third of the film is mostly exposition on the relationship between a single mom and her son. The son has issues, but it’s not really clear from the performance whether the issues are inherent, or a function of the particular circumstances faced by mother and son. You never get the sense that they are on the same side. The character of Samuel is portrayed in a very unsympathetic manner for most of the film. If that was the director’s intent, then it came off beautifully. But that was also, for me, the problem with the film. Without a rooting interest, you’re put through a series of frightening and dreadful scenarios, lacking in emotional balance. The cliché for horror movies is “Get out of the house!” But in those scenarios, you want all the good guys out of the house. In fairness, the film avoided standard horror techniques in favor of a slow burn. But the lack of a rooting interest, for me, negated the artistic accomplishments. And the slow burn never had a satisfying resolve, in my opinion. It’s hard to write a compelling story without a protagonist (a good guy, or a good girl). This film comes close to proving that wrong. There is no character in the film that comes across as more than marginally likable. I’m sure there will be many people who will watch this film and love it. My review is just my opinion. Oh, and don’t take young children to this movie. It is unrated and would be very disturbing to young children, especially those who are in non-traditional family situations. This film, if viewed by young children, would generate nightmares for years to come.